There are many genes that affect the Labradors coat color. We have gotten many questions from customers about how we know what color our puppies will be. The hope of this description is to provide a simplified answer for this common question. Individuals who are opposed to the dilute movement will state that it is impossible to have a Labrador carrying the dd gene and that they are mixed with Weimaraners. Back whenever the breed was created many breeds where bred in. This was just before being recognized by the AKC. Breeding Chesapeake Bay Retrievers, the Newfoundland, and St. John water dogs created the breed. Chesapeake Bay retrievers carry the dd gene and often come in an ash color very similar to dilute chocolate. The AKC recognizes charcoal as dilute black, silver as dilute chocolate, and champagne as dilute yellow. We will not advertise our dogs as rare, however we take extra care to produce dilute Labradors from champion lines so they will be priced accordingly. There are many genes involved in determining a Labradors coat color. There are some critics of Silver Labradors so keep this in mind. All dogs have the exact same genes. Here is a simple explanation for these genes & how they work in Labradors & how we get Silver. A This gene causes a solid coat color. Ee This is the same as EE except the yellow gene is present. ee If the ee gene is present the coat color is always yellow. Unless ee is present the other genes below determine coat color. BB If this is the determining then the coat color will be Black. Bb If this gene is present the coat color will be Black but will also have the Chocolate gene. bb If this is the determining gene then the color coat will be Chocolate. dd This is the recessive dilute gene. When this gene is present in both parents the coat color can be Silver, Charcoal or Champagne. There are 81 possible crosses between parents for coat color in the litter outcome. When dd ” dilute gene ” is involved & both parents are a dilute color. There are 81 possible crosses between parents for coat color in the litter outcome. Here is a gene chart explaining the 3 dilute colors in Labradors. If both parents have the dd ” dilute gene” & one or both are not a dilute color there are 162 possible crosses between parents for coat color in the litter outcome. If this is the case there is a possibility of all 6 colors in a single litter. There are those on both sides of the issue concerning the legitimacy of silver labs. DNA testing has provided evidence that the silver lab is indeed a true labrador retriever. At the end of the Twentieth Century, the frequency of silver (gray) labs began to increase in North America due to an increase in the number of chocolate labs in the gene pool of Labrador Retrievers. These Silver Labs in turn fueled an enormous controversy within the Labrador community. Fortunately, by the advent of the Twenty-First Century, the controversy surrounding Silver Labs subsided except for a few remaining breeders of "standard" colors. Unfortunately, those holdout breeders who refuse to acknowledge AKC's acceptance of silver labs, continue to confuse the general public by making accusations about the purity of the Silver Labs breeding. In an attempt to quiet the ranting of the more vocal opponents of Silver Labs, one breeder of silvers offered a $100,000. 00 Silver Lab Challenge to any of these "experts" who wished to put their money where their mouth was concerning their accusations surrounding the ancestry of silver labs. Are Silver Labs Pure bred Labrador Retriever? DNA testing of silver labs was done during the close of the Twentieth Century and meticulous investigation of each silver labs ancestry was conducted by investigators from AKC. 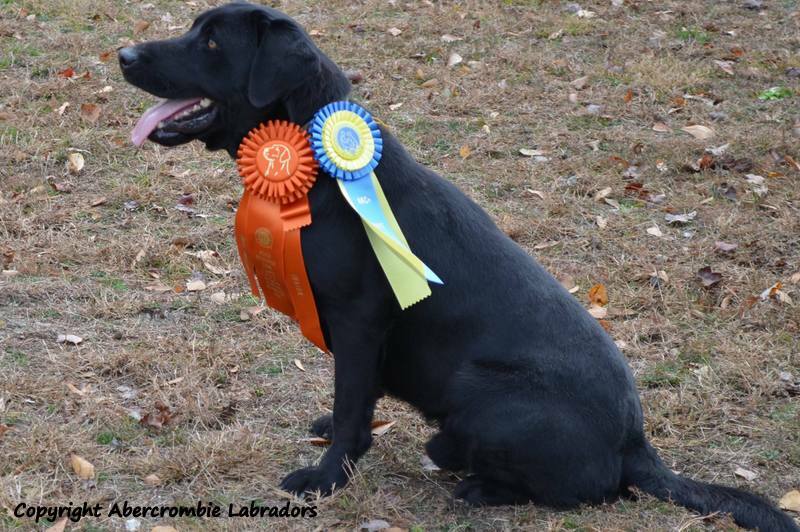 All conclusions were the same, "there was no reason to doubt that the dogs were purebred Labrador Retrievers," (see conclusion issued by AKC). Amazingly, opponents of Silver Labs counter these scientific conclusions with the accusation that the "cross-breeding" which allegedly produced the Silver Labs was either covered up by line breeding or happened to long ago to be detected by DNA testing. If anyone ever needed an indication of just how ignorant opponents of Silver Labs are, this statement should be the key. Every K-9 carries in its genes a complete history of its ancestors going all the way back to wolves. Everything written about the Silver Labs is based upon speculation. One statement that is commonly made is that there had to have been a Weimeraner introduced into the bloodlines to produce the silver color. This statement has been proven false. UC Berkley studied the genetic makeup of the Silver Lab against that of the Weimeraner. Researchers concluded that it was not the same. Silver Labs are pure bred Labrador Retrievers and their ancestry is beyond reproach. Why The AKC Registers Silver Labradors As Chocolate? Color photographs of these dogs were forwarded to the office of the American Kennel Club where the staff of the AKC and the representative of the Labrador Retriever Club of America examined them. Both parties were satisfied that there was no reason to doubt that the dogs were purebred Labrador Retrievers, however both parties felt that the dogs were incorrectly registered as silver. Since the breed standard describes chocolate as ranging in shade from Sedge to Chocolate, it was felt that the dogs could more accurately be described as chocolate than as silver."